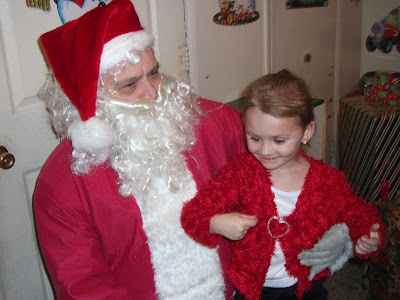 On Christmas Eve Santa stopped by my sister's house. 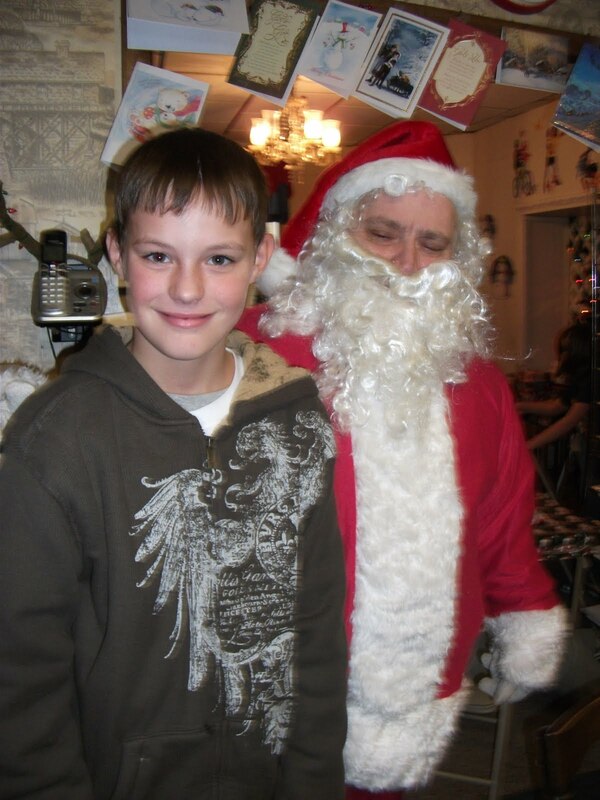 Some of the kids were enthused to tell them their Christmas wishes, while others wanted nothing to do with him. My great-niece, Gia, was sure she didn't care if Santa knew what she wanted or not. 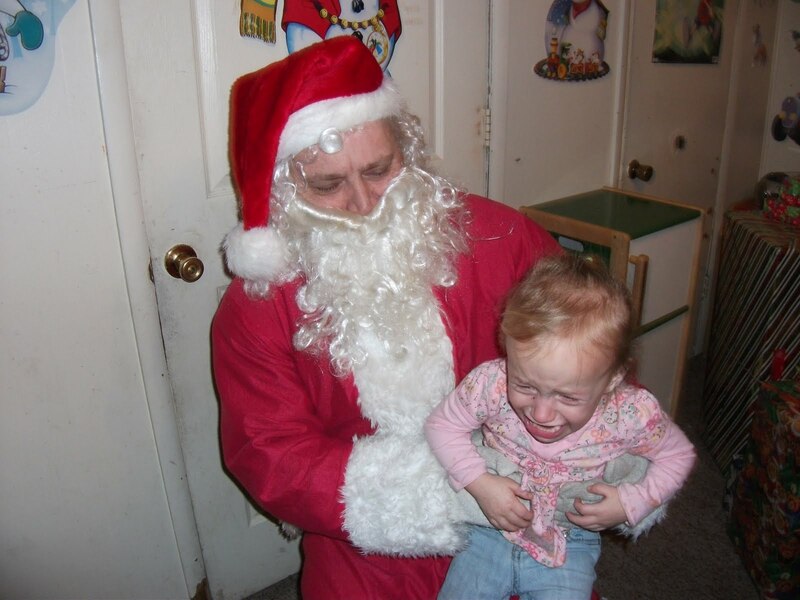 This was my great-niece, Ayala's, first year to sit on Santa's lap. 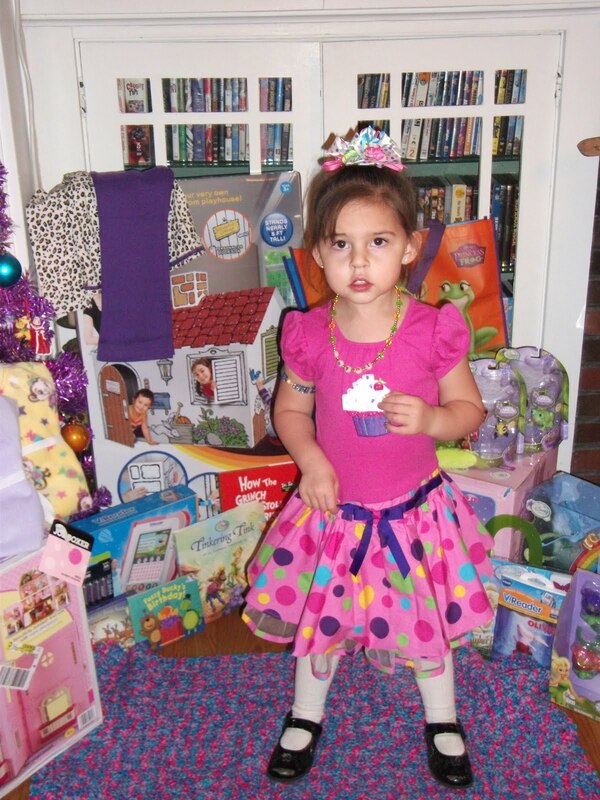 My great-niece, Imani, was adamant that she get a Tinkerbell Kitchen for Christmas. Santa obliged the next day. Great-niece, Faythe, didn't have much to say but was happy to see Santa. 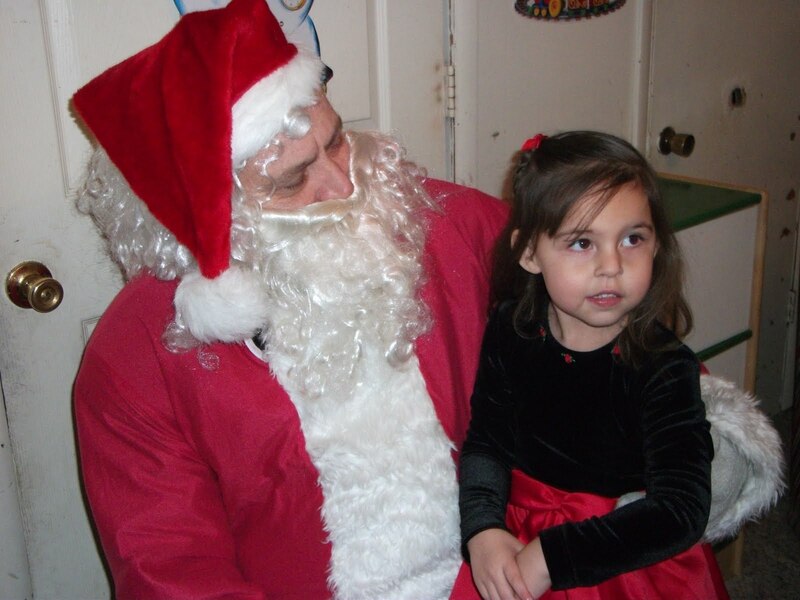 Gia and her sister, Zoe, were all right being next to Santa as long as daddy was close by. My son, Adam, was the first to break the ice to Santa. He let the little ones know that it was okay to talk to him. Thanks, Santa, for stopping by! It's been two months since I've last done a "Great Blog Giveaways" post. I've been so busy that I haven't had time to blog about other giveaways and I'm not sure that many of my readers benefited from it. I've decided to start posting again about other blog giveaways with this post and hopefully get feedback from my readers on whether it's something they'd like to see me post about again frequently or something they can do without. Alphabet Kids follows the fun adventures of a group of diverse children who learn about their multicultural backgrounds. Enter to win a set of all six Alphabet Kids books and a tote at Obviously MARvelous. Ends 1/9. Imprecious is dedicated to bringing you the finest in silver fingerprint charm jewelry. Enter to win an $88 Imprecious Gift Certificate at Momma Told Me. Ends 1/17. Cheeky Umbrella manufactures rain umbrellas that are designed to brighten rainy days. Enter to win an umbrella of choice at Mommy Kat and Kids. Ends 1/7. Head Chefs line of utensils are designed to make kitchen time fun for chefs of all ages. Enter to win a measuring spoon and a spatula at Mommy Kat and Kids. Ends 1/7. KinderGlo provides nightlight characters that are great daytime play pals and soothing friends for your child's nights. Enter to win a nightlight of choice at Kindred Spirit Mommy. Ends 1/9. You can also enter to win one at Fun Saving Money. Ends 1/3. Build a Dream Playhouses strives to deliver safe, affordable, eco-friendly products that stimulate and encourage the imaginations of all children. Enter to win a Build a Dream Playhouse of choice at Fun Saving Money. Ends 1/17. Jemos is an original eco-friendly shoe line exclusively for infants and toddlers. Enter to win choice of pair of shoes at My Organized Chaos. Ends 1/5. Red Envelope is the place for unique and personalized gifts. Enter to win a $50 gift certificate to Red Envelope at Born 2 Impress. Ends 1/9. Belle Baby Carriers designs and manufactures luxurious, high-style baby carriers made from the best materials available. Enter to win a Belle Baby Carrier of choice at Born 2 Impress. Ends 1/6. This updated and expanded edition of Under the Overpass contains added stories, an interview with the author, a “five years after” bonus chapter, and a new foreword from Francis Chan. I live in a large town that is dotted with just a few homeless people. Sometime I receive calls at work about them, how they are rummaging through trash or sleeping on people's porches. Law enforcement gets sent out to shoo them away, until the next person calls in a complaint. I know a couple of the homeless we deal with are there on their own accord, having whittled away what they own just to support their alcohol habit. I also know that there are a few who were forced onto the streets, due to economic situations. Under the Overpass is a book that brings home the harsh realities of being homeless. The struggles and trials that the homeless have to go through each and every day is heartbreaking. They have to fight for food, survival, shelter, and compansionship. Author Mike Yankoski not only tells the story, but lives it. He and his partner choose to give up everything they have to live on the streets, to tell the stories of the homeless and to test their own limits on how much they can rely on God's will. This book will make you look at being homeless in a new light. It will also put you in touch with your own self and make you question how far you'd be willing to go to put your ultimate faith in God. I received book for review from WaterBrook Multnomah. The opinions within this post are of my own and I was not influenced in any way. Please do your own research before purchasing products. Your opinions and results may differ. I totally forgot about Wordful Wednesday this week, so I will post about my Christmas next Wednesday. As a reminder, there will be no Keepin' Company Thursdays this week. It will resume on January 6th. The Welcome Wednesday Blog Hop is hosted by Frugal Invitation and is a way to find out about new blogs and acquire new followers. *Follow Frugal Invitation via Google Friend Connect. *Leave a comment if you are a new follower so she can follow back. *Grab the Welcome Wednesday button, and post it on your page. *Link up your blog every week, and follow as many blogs as you want! 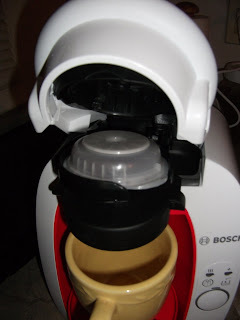 Almost one year ago I was introduced to Tassimo. I received a Tassimo Suprema Hot Beverage Machine and posted a Tassmio review. Before Tassimo, I rarely drank coffee. I owned a coffee pot but it was rarely used because I didn't want to make a full pot for only one cup. That and I didn't want to go through several steps just to have some coffee. Since owning a home brewing system from Tassimo, I've been turned on to different beverages that I can make quickly and to my liking. 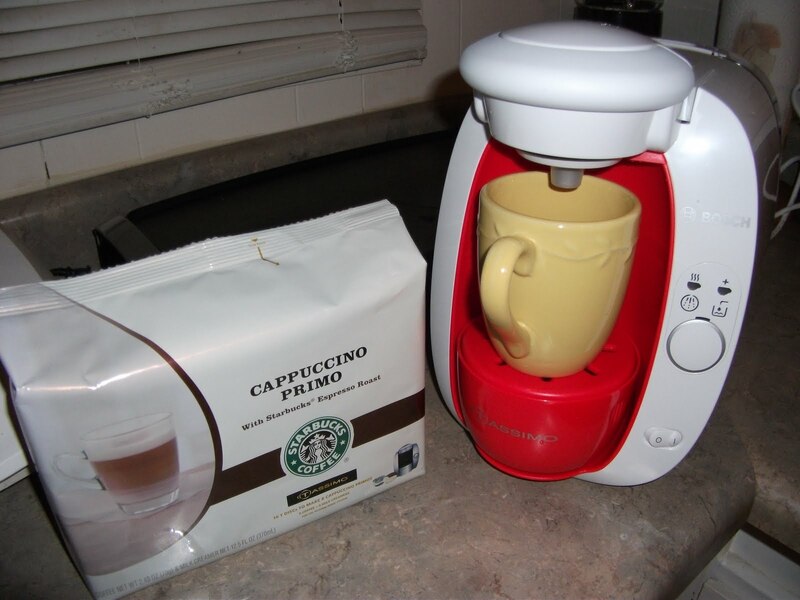 A cup of coffee, tea, hot chocolate, or cappucino can be made in just a short time. To say I am fond of Tassimo and its brewing capabilities is an understatement. I was beyond elated when I received a new version of the home brewing system. The Bosch T20 Home Brewing System makes a variety of your favorite drinks with the touch of a button. With this system, additional faceplates can be purchased to customize the look of it. I received a strawberry red brewer kit that includes a splash cover and cup stand. The majority of my kitchen is decorated in an apple theme so the look of the red and white brewer matches perfectly with it. Having the additional brewer kit is not a necessity, but it adds flair. The Tassimo home brewing systems are so easy to use that even my children (all six of them) had it figured out in no time. For whatever quirky reason, my son Adam swears that hot chocolate is waaaay better if it's made in a Tassimo. I think the experience of making it with a Tassimo is part of his reasoning. My family has made teas, coffees, cappuccinos, hot chocolates, and lattes with the Tassimo. It's especially pleasing to have a flavorful hot beverage in such a short time during the cold winter months. In a shortened version, what you have to do to make your beverage is turn the machine on and add a T-Disc. Push the button and watch your beverage be made. Seriously, it's so simple to do. Instructions are included, but it has taken us just a couple of tries to get the hang of it. We all have our favorite T-Disc beverages. I'm particularly fond of all the hot chocolate varieties and I like the Maxwell House Blend Coffee. 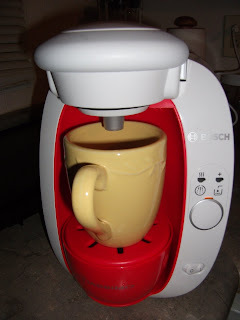 I don't necessarily see a quality difference between the first Tassimo home brewing system I reviewed and this one. My teenage daughter says that this one has a more modernistic, futuristic look, and is a little smaller in size. Being able to customize this one with a faceplate that matches your decor is an advantage over the other. The one and only improvement that I'd like to see with this particular machine is that it would be nice if the cord could be coiled and stored somewhere in the back so it does not dangle when it's not being used. 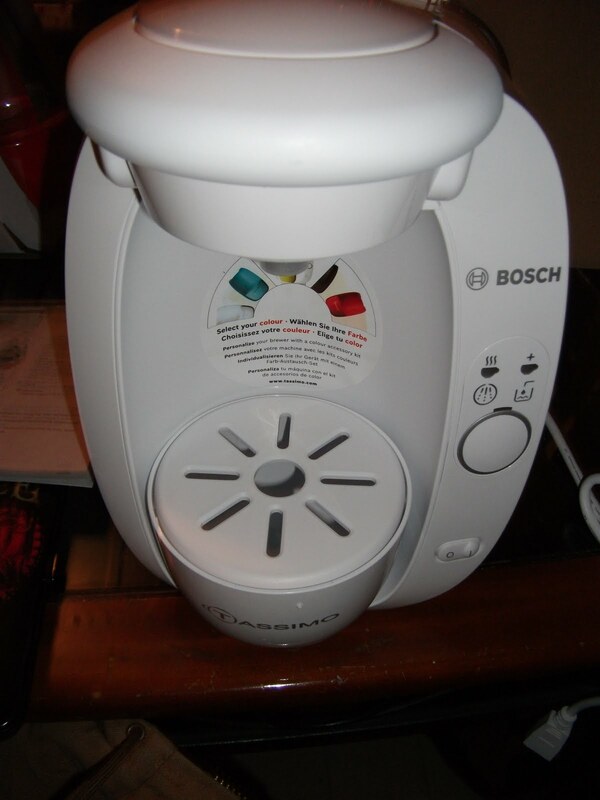 One person will win a white Bosch T20 Home Brewing System. Leave a comment with the T-Disc beverage you'd most like to try. Follow Tassimo on Twitter, tassimotaster. Subscribe to my blog via email (+3 entries). 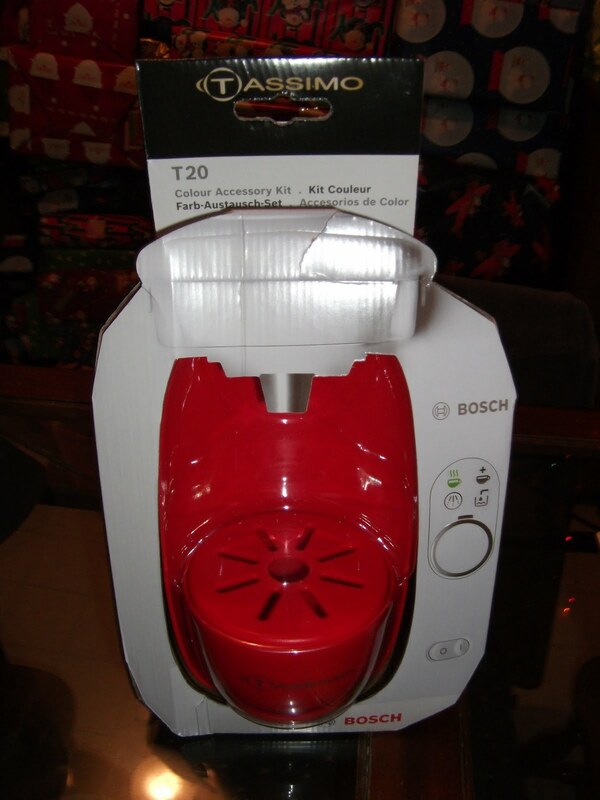 Leave a comment with something you learned from the Tassimo FAQs. Leave a separate comment for each entry and include your email address in the comments. Giveaway is open to residents of the USA. Giveaway ends 1/11/11 at 8 pm CST. Winner will be randomly drawn and will have 48 hrs. to resond to email notification or a new winner will be drawn. So here I am sitting here bawling, feeling defeated. I've mentioned that dentists are one of my worst fears and I've also mentioned that I'm facing the biggest fear of my life by going to the dentist to get my top teeth fixed. They've been messed up for a while now and my self-confidence went down the drain since I've lost two of my teeth near the front. I know people look at me differently when they see me talk. I make an effort not to smile anymore. I used to get compliments on my dimples. Now I get comments on my rotton teeth. I've tried to make light of it, I really have. I'm not a vain person by any means. I'm overweight and unfashionable. That I can deal with. What I can't deal with is looking like a year-round jack-o-lantern. Knowing that I was going to get new top teeth was like seeing a light at the end of the tunnel. Finally! I could talk and smile again, without KNOWING I was being looked at differently. The excitement overcame the fear. January 7th, that was going to be the big day. The day that I could start the process of walking out feeling like I was okay with myself again. Looks like that won't be happening. I received a call a few minutes ago from the dentist's office that my appointment needed to be rescheduled to January 28th. Three weeks later. I've already waited and waited and waited. It's not just my teeth being fixed, it's my self-confidence. Guess both will have to wait. Again, it's been a while since I've participated in Random Tuesday Thoughts, hosted by The Un Mom. Thought I'd get back in the game this week. Now that Christmas is over, is there any way we could fast forward to April. After that, the year can start slowing down again. I'm missing camp like crazy. We got a new (to us) camper and it's just sitting at the campsite, taunting me. I've gotten to look at it twice, but it's too cold to even go in and start decorating. What a tease! I swear to you that I was a grizzly bear in a former life. Ever since winter's been here, all I've wanted to do is hibernate. Oh, and gain 15 pounds. In just a little over a week I'll be going to the dentist to get my top back teeth pulled. It will be the start of a process in getting new top dentures. What a thought, thirty-four years old and in need of new teeth. I'm super excited to be able to smile with confidence again. I'm also in super panic mode the closer it gets. Dentists are in my top ten list of worst fears ever. Two weeks ago when I went to the dentist to get fillings on my bottom teeth, I received the most awesome high in the world in the form of nitrous. It will be my helping hand in my upcoming appointments as well. The dentist and I have come to the conclusion that the dial should be set at 20 for the next appointments. Thirty was too high and I could've swore I was going towards the light to say hello to Jesus. Ten was too low and made me aware enough to want to jump out of my chair and walk out....if it weren't for the fact that my legs felt like pure lead. The guinea pig that we bought at a yard sale in the summer is on the verge of driving everyone in the household insane. It's noisier than any baby I've ever known and a bigger eater than any teenage boy I've ever come across. Now I know why it was sold at a garage sale! Later today I get to go to the DMV and give them a good chunk of money for sticker renewal. That's money I could've spent on something much more fun, I'm sure. #10, tanya904 was randomly chosen as the winner of the Schleich calendar giveaway. I've emailed the winner and that person has 48 hrs. to respond to email notification or a new winner will be drawn. Congrats to the winner and thanks to all who entered. I've recently changed where the list of my current giveaways is at. All of them are now listed at the top left hand side of my blog. Between two teenage daughters and myself, we have five flat irons. We've experimented with different ones throughout time and have found that some work better than others. We even have our own differing opinions on which ones we claim to be the best. Misikko helps women easily shop and compare the best professional styling tools and beauty products on the market. Whether you're on the hunt for a Chi Straightener or a Croc Flat Iron, their goal is to help you find the right salon tools and products at the right prices. Misikko even offers free same day shipping on products. In February I did a review and giveaway for a Hana Professional Flat Iron from Misikko. It's the flat iron I've been using most often ever since receiving it. Thanks to Misikko, I was able to recently review the CHI Silk Infusion and the HANA Shine Shield Thermal Protectant. I've had both products for almost two months now and have seen a noticeable improvement in my hair since using them. I will say from firsthand experience that it's important to use thermal serums on your hair when straightening it with a flat iron. My hair turns into a dry, frizzy mess if I don't use a heat protectant on it. It looks like it's been singed instead of straightened. After learning that lesson, I use thermal serums on my hair each and every time a flat iron gets near it. Both the CHI Silk Infusion and the HANA Shine Shield Thermal Protectant come in 2 oz bottles. That doesn't seem like much, but it's lasted me through the last two months and I imagine it will last me for many more. Only a very fine amount is needed on the hair each time it's being straightened. At first I was a little surprised that the small bottles cost as much as they do but, after using them on my hair, it's apparent it's not generic formulas. And, as I said, a little goes a long way. I don't have a preference of one over the other. I switch back and forth between the two and both do well with protecting my hair against the heat elements. Both also give my hair shine and a look of healthiness. I do like the scent of the CHI Silk Infusion better. One person will win a 2 oz bottle of HANA Shine Shield Thermal Protectant and a 2 oz bottle of CHI Silk Infusion. Leave a comment with one of your favorite products at Misikko. Leave a comment with another favorite product from Misikko. Follow Misikko on Twitter, misikko. Leave a separate comment for each entry and include your email address in the comments. Giveaway is open to residents of the USA and Canada. Giveaway ends 1/11/11 at 8 pm CST. Winner must not have previously won a giveaway sponsored by Misikko within the last year. Winner will be randomly drawn and will have 48 hrs. to respond to email notification or a new winner will be drawn. I received products for review from Misikko. The opinions within this post are of my own and I was not influenced in any way. Please do your own research before purchasing products. Your opinions and results may differ. I'd like to wish all my readers and sponsors a wonderful Christmas and a peaceful New Year. I've been blessed to have such wonderful followers and I thank you all for continuing on with me. We've already celebrated our Christmas festivities. Right now all the kids are at their other sets of parents to celebrate with them, so it'll be pretty quiet around here for a short time. 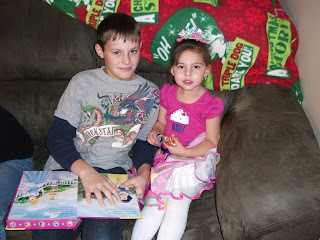 The kids seemed to like all that they got from Santa and my side of the family. My husband fared quite well too. From my family to yours, we'd like to wish you a MERRY CHRISTMAS! From now until January 31st, Hasbro is rewarding consumers who spend $20 more in gift cards or cash on select Hasbro toys and games with one of more than twenty FREE Hasbro toys and games valued at $10 or more. It's a pretty simple concept and a nice reward to get toys back for free. Just spend $20+ on select Hasbro toys or games, send in proof of purchase, and they'll send you a free gift. There's a long list of items you can choose from for your free gift. Official rules and more information can be found at the Supercharge Your Gift Card and Cash Too page. I received no compensation for this post. It is an informational post only. The opinions within this post are of my own and I was not influenced in any way. Please do your own research before purchasing products. Your opinions and results may differ. Goody goody gumdrops, it's almost Christmas! I'd like to wish all of my readers and followers a wonderful and cheerful Christmas. Myself and Traci66 have decided to take a short break from Keepin' Company Thursdays due to the holidays. It will resume again the night of January 5th. Thursday night, we are going to let the kids unwrap their mounds of presents. Then on Christmas Eve we will be going to my sister's for a gift exchange and dinner. I'll then go in to work later that night. 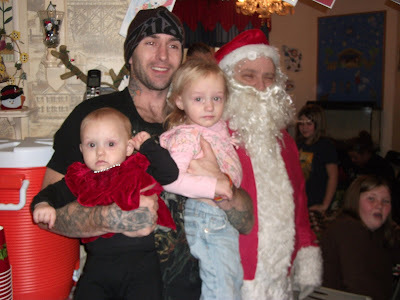 Christmas day it will be just me and the hubby because the kids will be going to their other sets of parents. Christmas came sooner than I would've liked, but I'm ready for it and ready to enjoy the festivities. 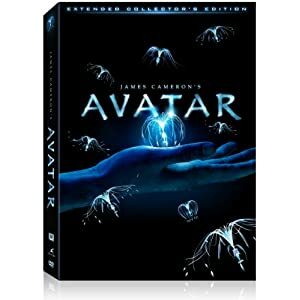 With its original storyline and outstanding theatrics, AVATAR was a box office hit. A winner of three Oscars and numerous other awards, AVATAR is about a paraplegic Marine dispatched to Pandora on a mission. The Marine becomes torn between following orders and protecting the world he feels is his home. 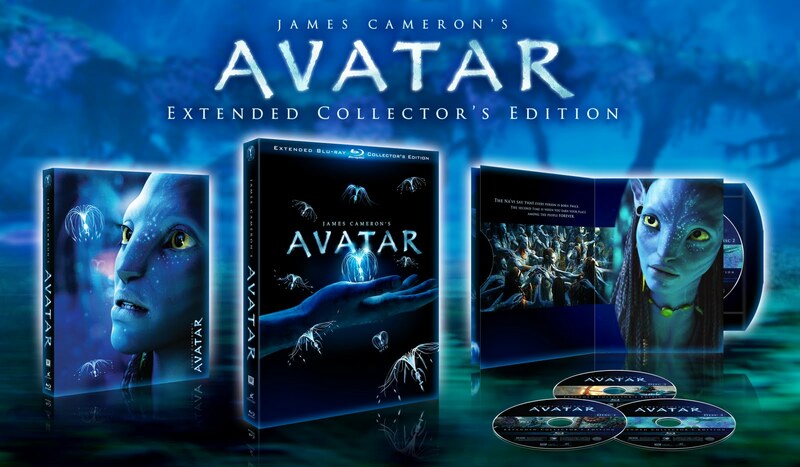 If you know someone who is a fan of this award-winning film, consider purchasing them the Avatar Three-Disc Extended Collector's Edition. With many extras, including the movie, it's sure to be a great gift for anyone on your Christmas list. · For kids because of the Family Friendly audio track – Utilizing this feature removes all offensive language so your kids in your house don't end up dropping some questionable words. · For someone who is a budding filmmaker because of the “Pandora’s Box” feature – Just one of the many interactive features on this Blu-ray, here, viewers can take an in-depth look at the movie in all three – yes THREE! – stages of production that the crew had to go through in order to create the final product. You can see how this was viewed and created in Performance Capture, Template (where the film looks more like a video game than a movie! ), and the end product. This feature also has interviews with Cameron and the other filmmakers and can be viewed as sort of a “master class” on the creation of “Avatar”. · For the eco friendly/green member of your family because of the feature, “ A Message From Pandora” – A fantastic extra feature to watch with any member of your family who is concerned about the environment. It documents James Cameron’s trip to Brazil where he met with some of the native tribes to show them his support and to speak up against the building of a dam that will destroy the ways of the indigenous people who live there. · For the techie – The Blu-ray format has a whole slew of pro’s – from being scratch resistant and backwards compatible, to having better quality graphics and sound. 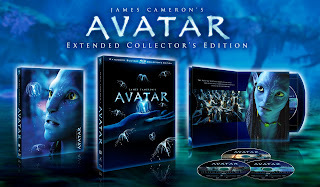 Two winners will each receive AVATAR: Extended Collector's Edition on Blu-ray. Leave a comment with who you'd like to win this for and if you've ever seen the movie. Leave a separate comment for each entry and include your email address in the comments. Giveaway is open to residents of the USA and Canada. Giveaway ends 1/6/11 at 8 pm CST. Winners will be randomly drawn and will have 48 hrs. to respond to email notification or new winner(s) will be drawn. I received no product for review or monetary compensation. This is an informational and giveaway post on behalf of sponsor. The opinions within this post are of my own and I was not influenced in any way. Please do your own research before purchasing products. Your opinions and results may differ. 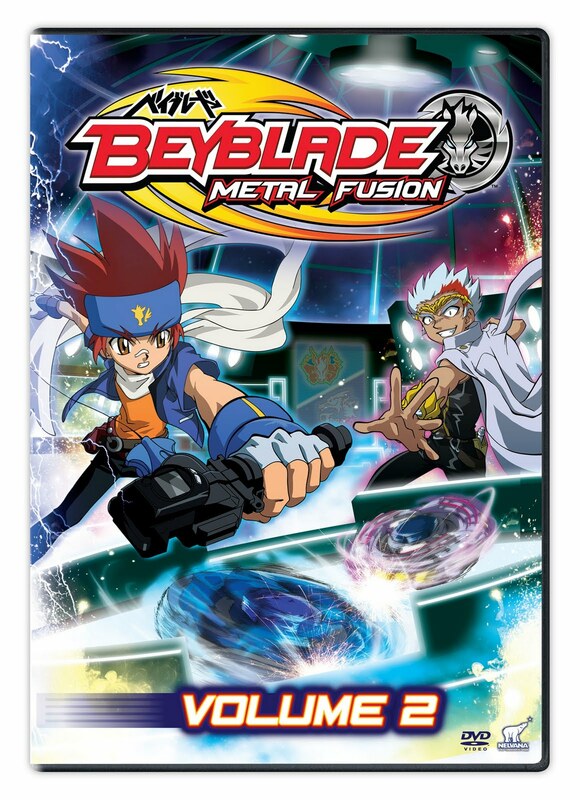 The battle between good and evil escalates to new heights as BEYBLADE: Metal Fusion Vol. 2 battles its way onto DVD January 4th from Nelvana Enterprises and Vivendi Entertainment. It offers a fresh take on the original hit BEYBLADE with new characters competing for dominance with their spinning Beyblade tops, battling against an evil organization, The Dark Nebula. My boys first learned of BEYBLADE: Metal Fusion when they watched the Vol. 1 DVD. Since then, they've taken a great interest in it. From the toys to the episodes on Cartoon Network, it seems to be the next big thing for boys since Bakugan or Yugi-Oh. 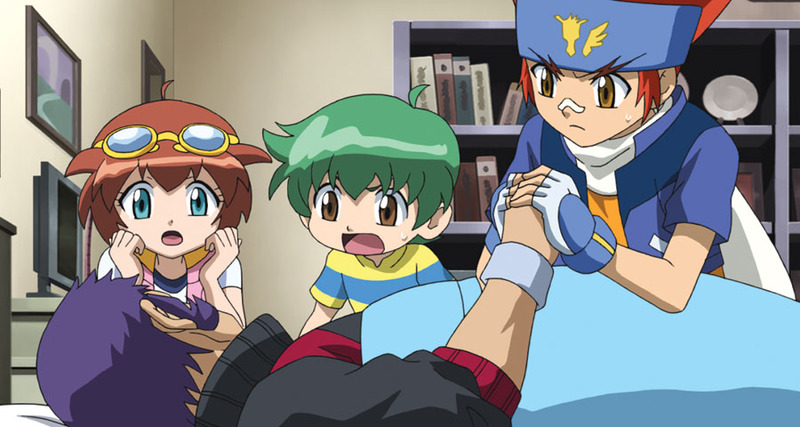 Beyblade's main character, Gingka, and his friends compete in battles with spinning tops, also known as Beyblades. They must take on The Dark Nebula to keep from world ruin. Although there's battles between good and evil, there's no outright violence or ill-harm. I'll admit that my girls don't see the allure of BEYBLADE and it's Japanese anime characters, but Logan and Adam are now devoted followers of this craze. 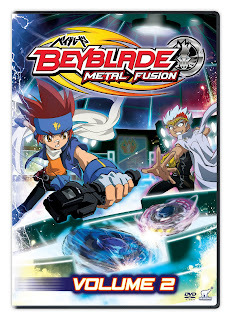 One person will win BEYBLADE: Metal Fusion Vol. 2 on DVD. Leave a comment with who you'd like to win this for. Leave a separate comment for each entry and include your email address in the comments. Giveaway is open to residents of the USA. Giveaway ends 1/6/11 at 8 pm CST. Winner will be randomly drawn and will have 48 hrs. to respond to email notification or a new winner will be drawn. 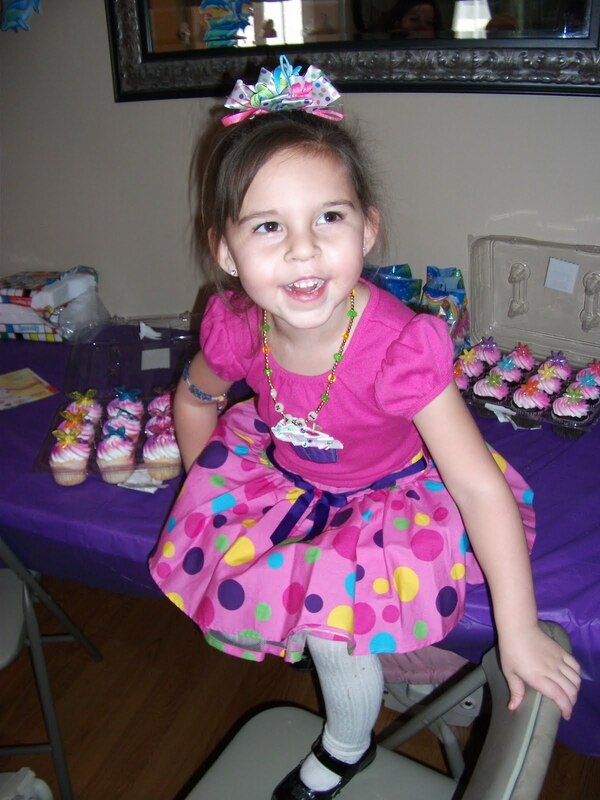 Last Sunday we celebrated my great-niece's 4th birthday. It's always nice to get together with family to do things like that. 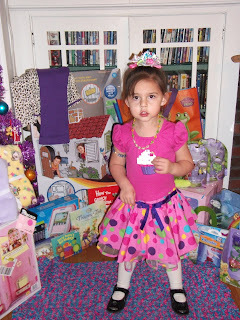 Imani received a lot of nice gifts for her birthday. 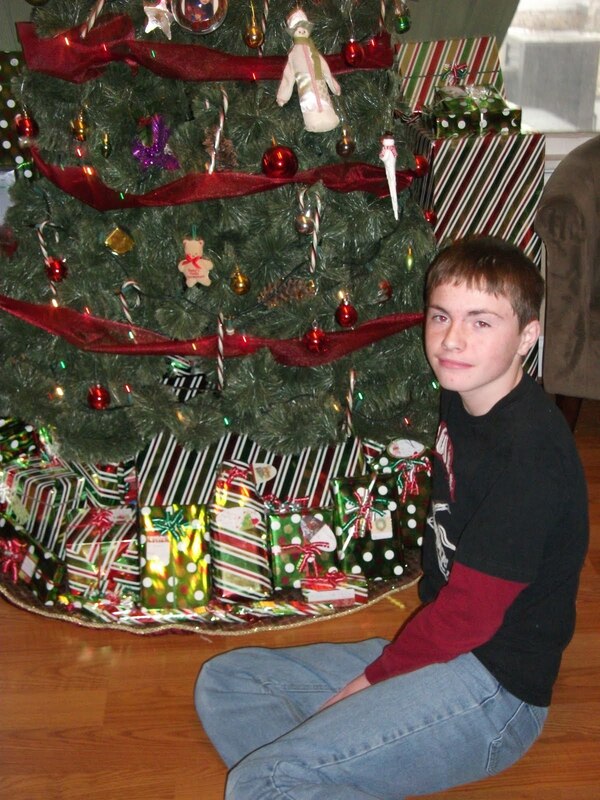 This is my son, Logan, sitting in front of their Christmas tree. Imani was bent on my son reading books to her. He happily obliged. 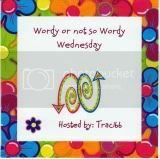 If you'd like to participate in Wordy or Not So Wordy Wednesday, link up at Traci66. If you'd like to link up to Wordful Wednesday, link up at Parenting by Dummies. When I was in school (yes, way back in the day) me and my friends would fill notebooks with our friends' names and then pass them around. We'd write comments in the notebook about what we thought of each friend. I still have most of the notebooks that I started, tucked away in my cedar chest. The Friendship Book is along the same concept, except in a hardcover book and with a better format. Designed for kids aged 6 - 12, this book encourages children to gather and write about the moments and relationships that mark their younger years. There is a section for the owner of the book to write their information in and the remaining sections are to be passed to the owner's friends to write in. Each writing prompt is in English and Spanish. Personal likes, special messages, photos, and other information is gathered from each person. My youngest step-daughter, Emma, really likes her Friendship Book. She's filled out her own information and has taken it to school for her friends to fill out. She says that her friends really like the book too and thought that filling it out was fun. I am fond of the beautiful illustrations that depict kids doing different things. I also appreciate that this book celebrates all that is positive. It's a good way for friends to get to know about each other, without any abasement. One person will win a Friendship Book: Off To School. Follow Friendship Book on Twitter, FriendshipBook. "Like" Friendship Book on Facebook. This review was made possible by Mom Spark Media. I received product for review. The opinions within this post are of my own and I was not influenced in any way. Please do your own research before purchasing products. Your opinions and results may differ. The winner of the Freshpair giveaway is #111, coriwestphal. The winner of the Udderly Smooth giveaway is #101, ruthhill74. The winner of the Dolphin: Story of A Dreamer DVD giveaway is #25, Pam. The two winners of The Dog Who Saved Christmas Vacation DVD giveaway are #46, Haydensmommy05 and #1, Heidi Jane Blankets. Congrats to the winners and thanks to the sponsors. Giving and helping those less fortunate during the holiday season, or anytime of the year, always leaves me with a warm, fuzzy feeling. Three times a year me and the kids clean house thoroughly and donate our gently used clothes and toys to local charity organizations. It not only keeps my home clutter-free, it also leaves us happy knowing that someone else will get use out of the items we no longer use. Cepia LLC was kind enough to send me and 99 other bloggers Zhu Zhu Pets to give to charitable organizations this holiday season. The delivery truck showed up at my door a few weeks ago with thirteen boxes filled with 104 Zhu Zhu Pets to donate. My children were as equally excited as I was. 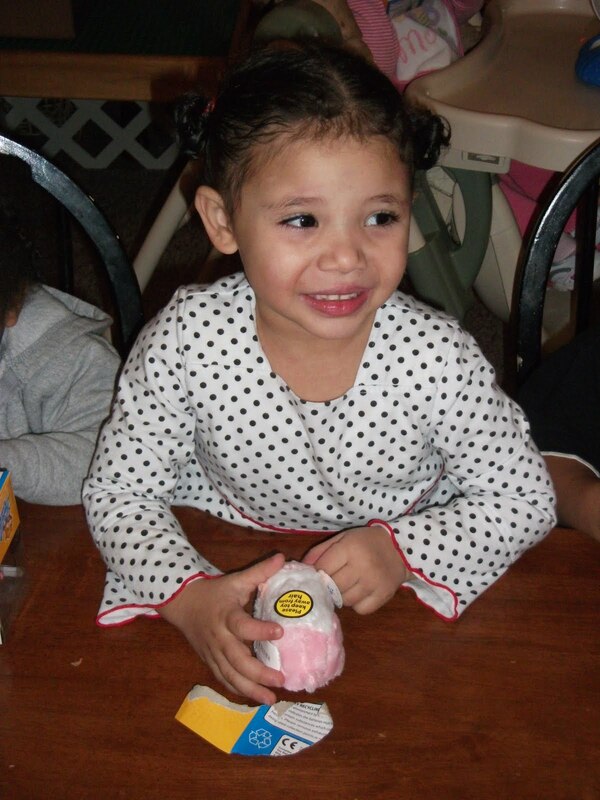 They already own a number of Zhu Zhu Pets and accessories, and wanted other children to experience the joy and fun of owning one. 100 bloggers + 104 Zhu Zhu Pets each to give away = a lot of happy children this Christmas. 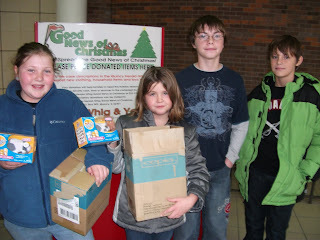 The task of donating so many toys was rewarding, and even hard at times. Me and the kids brainstormed about the different organizations we wanted to donate them to. After contacting some of our first choices, we found out that no mention could be made by blogging about it due to their privacy laws. For those organizations, we instead anonymously donated our gently used clothing and toys that we had bagged up. My oldest daughter is in Key Club at her school. It is an after-school extracurricular club where the students donate their time and services to organizations. It's basically community service, except they choose to do it. One service that Key Club is participating in during the holidays is raising money and getting donations for Toys for Tots. Shelby donated a large number of the Zhu Zhu Pets to Toys for Tots during one of her Key Club meetings. 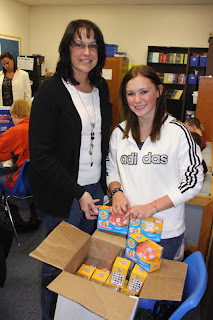 Pictured with her is one of the spokespersons for Toys for Tots. These two girls pictured above, along with a handful of their peers, were each given a Zhu Zhu Pet. Names of the girls and the organization will be withheld due to request of privacy. I actually wrapped the Zhu Zhu Pets in wrapping paper and presented one to each of the kids. The smiles and grins on their faces were enough to melt my heart. Me and the four youngest kids headed to the local mall one afternoon to donate some Zhu Zhu Pets. Some of them were set in the Good News of Christmas bin. Good News of Christmas was started as a local project to help selected people with their holiday requests due to hardships. 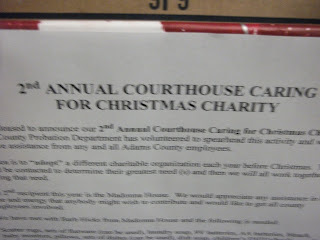 We then donated more in the Toys for Tots bin that was located inside the Dress Barn store. 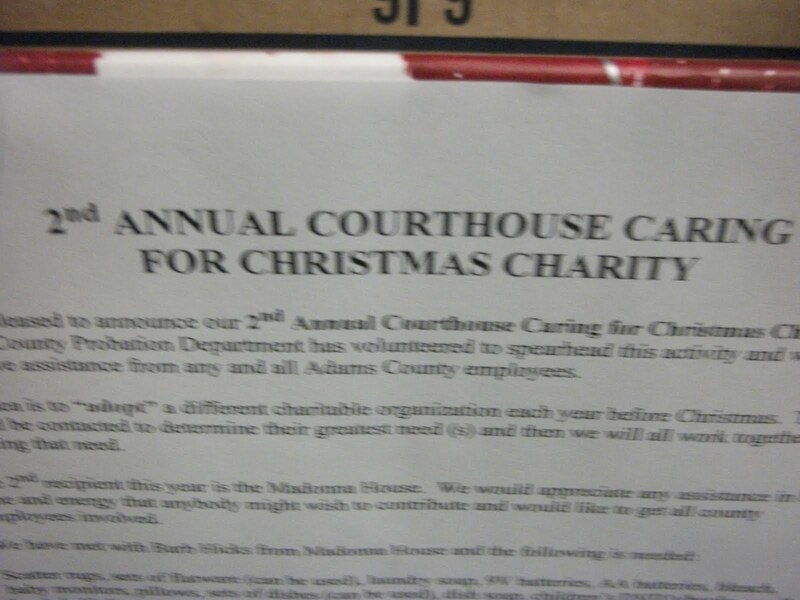 The associate at Dress Barn was amazed at the donation and couldn't express her thanks enough. 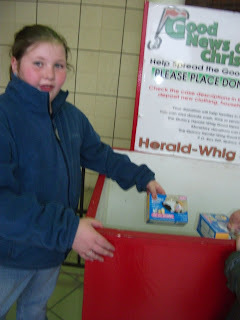 I donated the remainder of the Zhu Zhu Pets to the 2nd Annual Courthouse Caring for Christmas Charity bin that was set up at work. It has become a tradition for city and county government employees to select an organization in need and donate requested supplies to them. This year's selected organization was Madonna House, a not-for-profit organization that helps homeless women and their children. I'd like to give a heartfelt thanks to Cepia LLC for making it possible for bloggers to donate the Zhu Zhu Pets and make a brighter Christmas for children. I was happy to have been given the task. 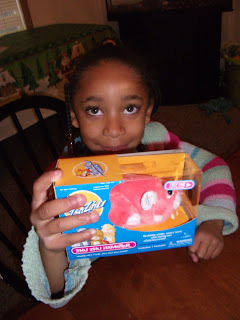 ZhuZhu Pets®, the 2010 “Toy of the Year” that has taken over the hearts of kids everywhere, are now taking over the blogosphere and zhu-ooming into the holiday season with the spirit of giving. This December, Cepia LLC, the makers of ZhuZhu Pets® are spreading joy to children across the country by providing 100 bloggers with ZhuZhu Pets® and accessories to be donated to their charity of choice. 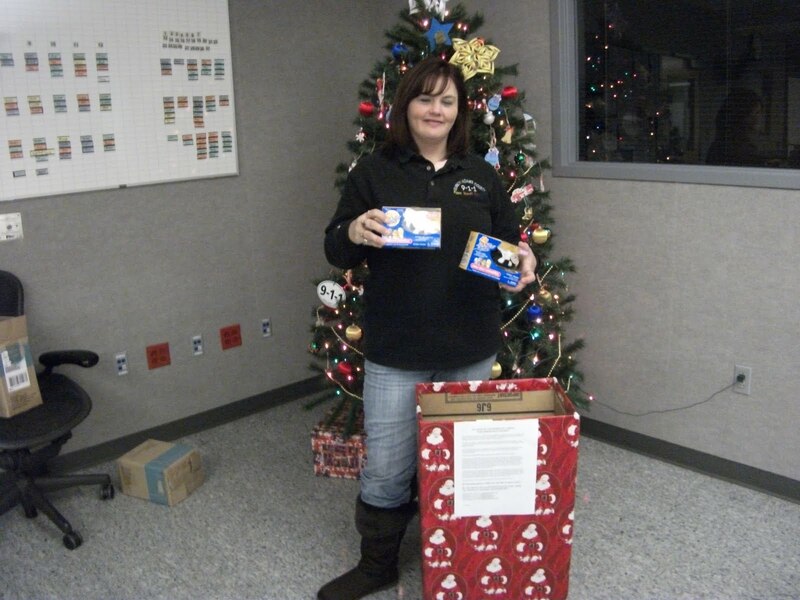 The toy donations aim to spread holiday cheer through Cepia's charitable giving program, Random Acts of Zhu (RAZ), and to inspire others to participate in charitable acts this holiday season. 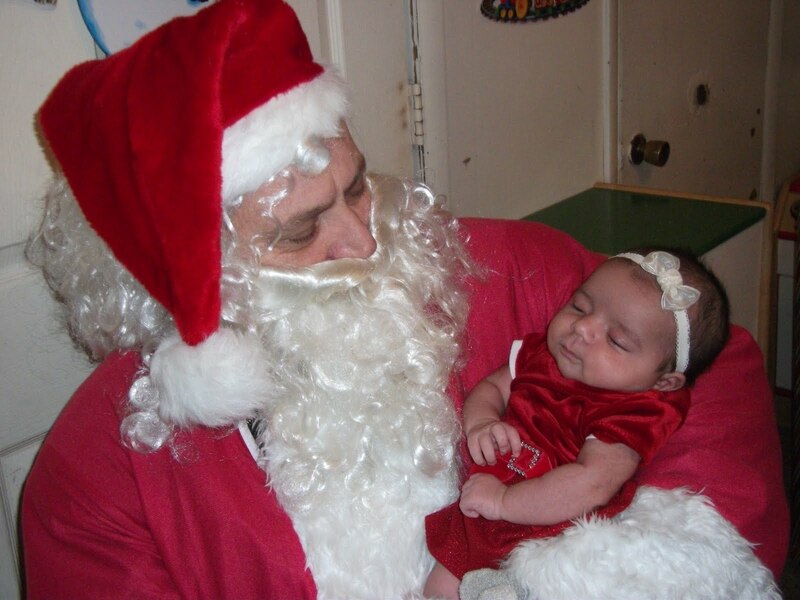 RAZ was initiated in 2009 and has been responsible for bringing thousands of ZhuZhu Pets® to pediatric hospitals across America during Cepia's "Christmas in July" toy drops. Last holiday season ZhuZhu Pets® initiated its "Santa's Helpers Program," spurring the delivery of ZhuZhu Pets® to eager children on Christmas morning in order to fulfill Santa's promise to deliver the number one toy on every child's wish list. ZhuZhu Pets® became the No. 1 toy for children last holiday season and have gone on to be named the 2010 "Toy of the Year." ZhuZhu Pets® engage children and their imaginations for hours just like real hamsters, but without the maintenance and mess. They dart around, scurry from place to place and make unique sounds and noises. Children have the opportunity to build, change and rearrange their hamster habitats for a unique, interactive play experience every time. I received Zhu Zhu Pets on behalf of Cepia LLC to donate. I received no monetary compensation. The opinions within this post are of my own and I was not influenced in any way. 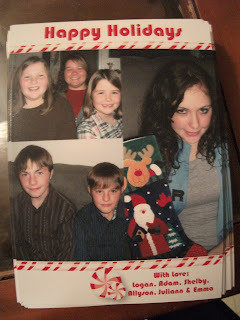 Four years ago my mother gave every family a Hickory Farms gift set for the holidays. It was a gift well-liked by all. Since then, I look forward to going to the mall to the Hickory Farms kiosk during the holiday season to purchase food gifts for myself and others. 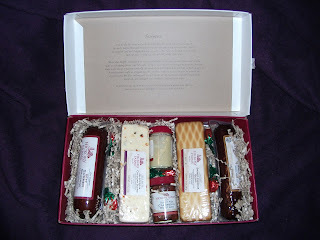 Hickory Farms recently sent me a Beef & Turkey Hearty Hickory Gift Box to review. My mouth watered as I opened the package and waited for my husband to come home so we could eat it together. I like how the contents are laid out in the package, carefully arranged to be visually pleasing. Scattered throughout are strawberry hard candies. I was impressed that the packaging is made with 100% recycable materials. Me and Jason dug into the box as soon as he got home. With a box of Ritz crackers, we loaded up different flavor combinations. I liked everything, from the sausages to the mustards. Jason did too, but his favorite was the Jalapeno & Cheddar Blend. I'd like to say that we have some left, but we have went through the whole box in a matter of days. It has made for delicious evening snacks. 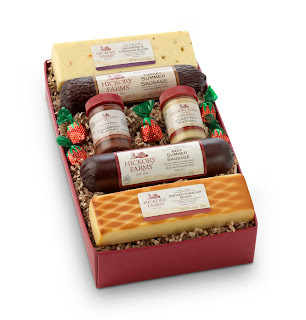 Hickory Farms' savory sausages, favorite cheeses, and other gourmet goods can be found online, in catalogs, in leading supermarkets, and in retail centers throughout the holidays season. With every purchase of the Party Planner Gift Box, Hickory Farms will donate $5 to Share our Strength. Also, for each person that "likes" Hickory Farms on Facebook, the company will donate $1 to Share Our Strength. To honor men and women serving in the armed forces, Hickory Farms offers free shipping on some of their most popular assortments to any military APO/FPO address around the globe. 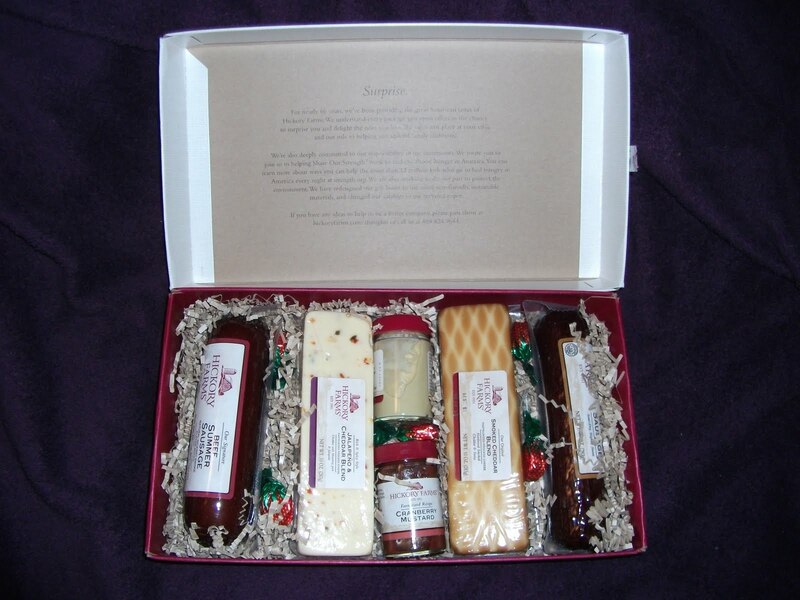 One person will win a Beef & Turkey Hearty Hickory Gift Box. Leave a comment with one of your favorite products from Hickory Farms. Leave a comment with another favorite product from Hickory Farms. Follow Hickory Farms on Twitter, hickoryfarms. "Like" Hickory Farms on Facebook. Leave a separate comment for each entry and include your email address in the comments. Giveaway is open to residents of the USA. Giveaway ends 1/2/11 at 8 pm CST. Winner will be randomly drawn and will have 48 hrs. to respond to email notification or a new winner will be drawn. I received product for review from Hickory Farms. The opinions within this post are of my own and I was not influenced in any way. Please do your own research before purchasing products. Your opinions and results may differ. I know everyone's busy with the holidays right now, including me. Just wanted to give a gentle reminder that two of my giveaways end tomorrow night, the 18th, at 8 pm CST. Don't want you to miss out on a potential great win. As of this writing, there's less than 100 entries for both. Call me a fish, but I always have to have a drink on hand. Unless I'm asleep, I have a soda, water, or coffee by my side at all times. I'll sip throughout the entire day. My most recently discovered beverage holder of choice is a Tervis tumbler. Whether I'm drinking a cold refreshing drink or a hot warming beverage, the 16 oz. tumbler I have keeps my beverages at the temperature they're supposed to be. Headquartered in North Venice, Florida, Tervis Tumbler manufactures crystal-clear insulated drinkware that is guaranteed for life. Made in the USA since 1946, the unique, double-walled tumblers have kept cold drinks colder and hot drinks hotter for a longer period of time. Tervis Tumblers are dishwasher and microwave safe and are sold in 6000+ retail outlets nationwide. The company is dedicated to upholding the same high standards of quality craftsmanship and customer relations today as it has for decades. For additional information about Tervis Tumbler, visit www.tervis.com. I received a 16 oz. Live Love Laugh tumbler with a red travel lid. It's a motto I try to live by everyday and seeing it is a gentle reminder to do so. The tumbler itself is clear in color and has a patch on the inside with the Live Love Laugh design. I like that I don't have to worry about the design itself becoming worn out because it's not on the outside of the tumbler. When I'm in the car, I put the lid on my tumbler to keep it from spilling. The lid has a slider that opens and closes. The tumbler fits snugly in my vehicle's cup holder. I don't have a dishwasher so I can't vouch personally for it being dishwasher safe; however, I've used it in the microwave a number of times. The fact that I don't have my drink sweating and condesating on my furniture and work desk is a major plus. There are numerous designs available for the Tervis tumblers and ice buckets. It's hard to narrow it down to just one favorite. Personalization is even available for an additional fee. I received product for review from Tervis. The opinions within this post are of my own and I was not influenced in any way. Please do your own research before purchasing products. Your opinions and results may differ.